Home / Cervical Stenosis / What is Spinal Stenosis? The term ‘stenosis’ comes from the Greek word meaning “choking”. Think of spinal stenosis as a condition in which the spinal nerves in the lower back and in the neck are being choked. As the choking worsens, the pressure increases on the nerves and pain can develop in the neck and the low back, and may radiate into the arms and legs. It’s often the leg or arm pain that really gets your attention and can be severe and disabling. Many patients with lumbar spinal stenosis notice that their leg pain lessens the moment they sit down or when they lean forward on a shopping cart in the supermarket. So how does this all happen? As the spine ages, discs (the cushions between vertebrae) and joints may degenerate, bone spurs form, ligaments may thicken or “hypertrophy”, and muscles atrophy. This natural degeneration of all the elements of your spinal column can lead to increased pressure on the nerves in the spine. The nerves and the spinal cord can become compressed or squeezed due to this degenerative process and due to the arthritis. Spinal stenosis affects the neck (cervical spine) and the low back (lumbar spine). 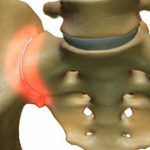 Lumbar stenosis: In lumbar stenosis, as the nerve roots in the lower back get compressed, patients may experience sciatica, which refers to the tingling, numbness or pain that starts in the lower back and radiates through the buttocks and into the legs. Weakness in the legs may develop as well. Cervical stenosis: In cervical stenosis, the spinal cord is compressed, and this can be far more serious, and may cause body weakness or even paralysis. These patients also often experience neck and arm pain, and numbness and weakness in the arms, hands, and fingers. Lumbar stenosis and cervical stenosis pain will often fluctuate, with some pain flare-ups more severe than others, and patients’ pain levels and flare-ups can vary. Because each patient and their symptoms are unique, treatment is taylored to each individual patient and to meet their needs. 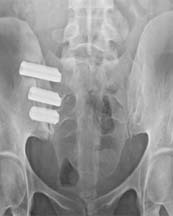 A patient’s response to nonoperative treatment measures will play a big part in a spine surgeon’s assessment and any suggestions for spine surgery, if required. If you have spinal stenosis, keep good notes about what causes your pain and what helps. You’re an essential part of your care and treatment plan. An estimated 400,000 Americans suffer from the lower back and leg pain due to lumbar spinal stenosis, so you are not alone if you’re experiencing the effects of this treatable condition. Remember that most patients can be treated without surgery. Cervical stenosis can lead to permanent damage to the spinal cord, so these symptoms should not be taken lightly. Do not delay and seek out evaluation and treatment under the care of a reputable board certified spinal surgeon if have been diagnosed with cervical spinal stenosis or if you feel that you may have this treatable condition. Lumbar spinal stenosis is more common than cervical stenosis, but if you have been diagnosed with either of these, you should be evaluated by a spine surgeon. Appropriate radiographic workup includes x-ray, MRI, and possibly CT scan imaging studies. Fortunately, most patients with lumbar and cervical stenosis do not require surgical treatment. However, ultimately your doctor will recommend what treatment is best for you.